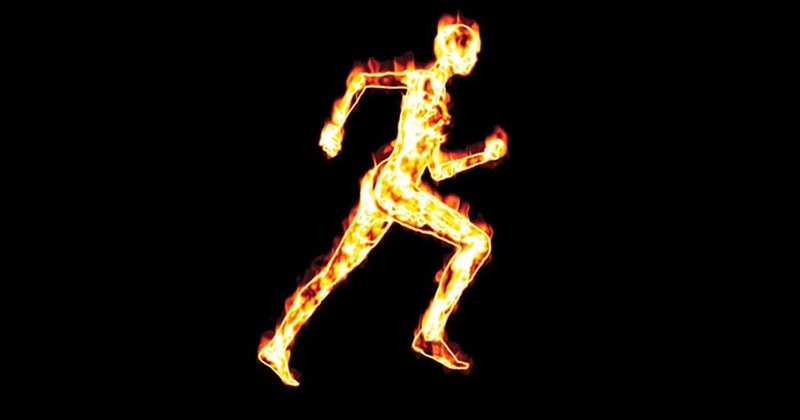 Cardio – a waste of fat burning time! It may sound hard to believe, but studies are now proving people who perform long bouts of chronic cardio suffer from decreased thyroid function, release more of the stress hormone cortisol, and increase their appetite – all at the same exact time. Whether it’s toning classes, yoga , 5k races, Pilates, or “core training” – all these things are “healthy” for you, but they’ll never flatten your belly or release the hormones that keep you young and burn off stubborn fat. We are not saying you should go all-out and risk injury, but learning to push yourself for short, hard bursts is by far the most efficient and effective way to force your body to release fat burning hormones. 2. Skoluda, N., Dettenborn, L., et al. Elevated Hair Cortisol Concentrations in Endurance Athletes. Psychoneuroendocrinology. September 2011.
. Cakir-Atabek, H., Demir, S., Pinarbassili, R., Bunduz, N. Effects of Different Resistance Training Intensity on Indices of Oxidative Stress. Journal of Strength and Conditioning Research. September 2010. 24(9), 2491-2498. 5. J Clin Endocrinol Metab. 1992 Jul;75(1):157-62. Effect of low and high intensity exercise on circulating growth hormone in men. authors: Felsing NE1, Brasel JA, Cooper DM. 6. C. Bass, “Forget the Fat-Burn Zone: High Intensity Aerobics Amazingly Effective,” Clarence and Carol Bass, http://www.cbass.com, 1997. Trained Men and Women,” Eur. J. Appl. Physiol. 67 (1993) : 420-425..
6. I. Tabata, et al., “Effects of Moderate-Intensity Endurance and High-Intensity Intermittent Training on Anaerobic Capacity and VO2max,” Med. Sci. Sports Exerc. 28.10 (1996) : 1327-1330. 6. I. Tabata, et al., “Metabolic Profile of High-Intensity Intermittent Exercises,” Med. Sci. Sports Exerc. 29.3 (1997) : 390-395. 6. 2011 study conducted by the American College of Sport Medicine. Spaghetti squash with Kale, chick peas and hazel nuts. I’m not sure how many times I’ve written or read this, but it’s true. The dietary system or nutritional framework that you choose to employ is far less relevant than your level of compliance within it. The reality is that most nutritional approaches have very similar principles, the overriding one perhaps being that you need to eat within your calorie requirements, being in a deficit if your goal is weight loss. Is this really what you had for breakfast? Most systems will assume that most of what you consume comes from decent sources, with the key messages being to drink more water, eat your vegetables and get enough protein. Regardless of what you choose, the bottom line is that you’ve actually got to do it, consistently. Cheating on the gym is the same as cheating on your diet: it doesn’t work. Again, most approaches and systems will share common underpinning principles, such as prioritising resistance training for example, so what you choose to do is far less important than you actually doing it consistently. The simple way to think of nutrition and exercise when it comes to changing your body shape and composition, is that your diet will look after fat loss, while your training or exercise will look after your muscle mass – think toning – and cardiovascular health. Both are important. The bottom line is that you need to turn up three times per week, focus your mind on the task at hand, and give it a good go. Invisible training is a term I borrowed from a well-known coach in professional sports, which refers to various recovery and regeneration strategies, or the things that we do outside of the gym that often go unseen. I use the term in general fitness circles to describe the exercise or movement that we do outside of our structured workouts – that is, activity that keeps the systems ticking and burns additional calories. 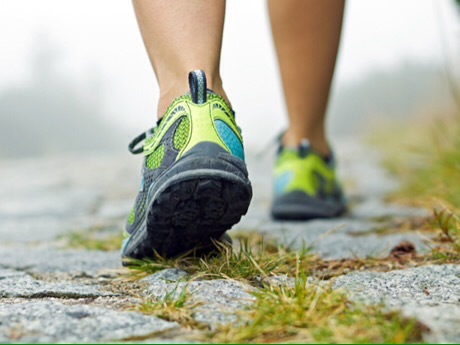 Things such as walking to work, taking the dog out, playing tag with the kids, taking the stairs, swimming a few lengths on holiday, and all of the other things that you do not record or perhaps think of as exercise, but are actually equally, if not more important than, your scheduled sessions. There are more options than you think!! Sometimes, the whole world of snacking seems to be based on the one thing you’re supposed to limit: refined carbs. Even the “healthier” packaged items, like granola bars, smoothies, and crackers, are full of them. If you look past the vending machine, though, you’ll find plenty of other tasty options, like these smart snacks. The best part? They’re as easy to toss together as they are delicious. Sweet and salty flavors add up to a great snack. 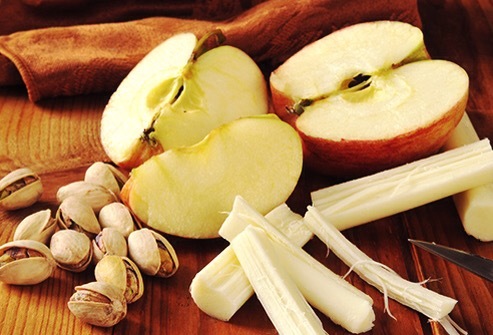 Pair half a cup of apple slices with string cheese for about 10 grams of carbs. The combination of protein, fat, and fiber makes it a filling and satisfying nosh. 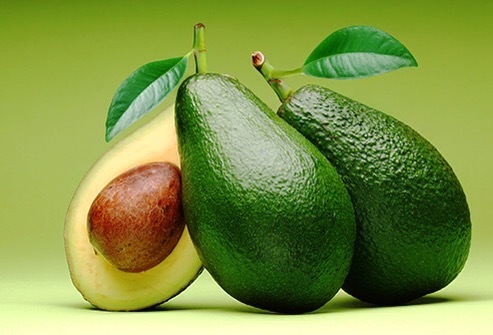 Avocados have a place in your diet outside the guacamole bowl. Mash one-quarter of a ripe avocado and spread it on two light rye crisps for a crunchy, creamy snack with 18 grams of carbs, plus plenty of fiber and heart-healthy fat. It’s like a mini open-faced sandwich. Take your yogurt in a savory direction. 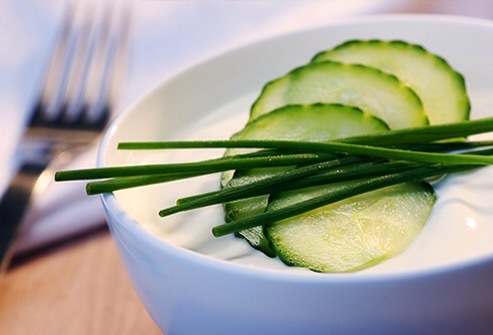 Use a cup of low-fat, plain Greek yogurt as a creamy dip for 1 cup of refreshing cucumber spears. It adds up to12 grams of carbs and a mega dose (20 grams) of appetite-satisfying protein. It’s like a version of the famous Greek dish, tzatziki. Deli turkey has uses beyond a sandwich filling. 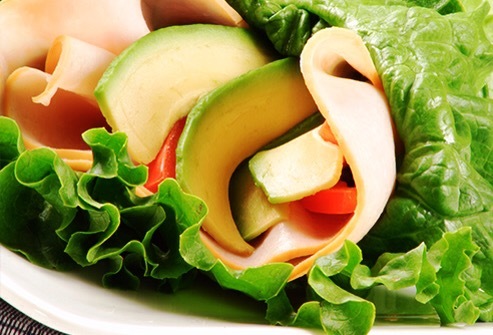 Lose the bread and roll up 1 ounce of sliced turkey in lettuce leaves with mustard. This light, crisp snack has about 3 grams of carbs and will get you through the afternoon. Cheesecake doesn’t make for a healthy snack option, but you can mimic a little of the flavor in a healthier way. 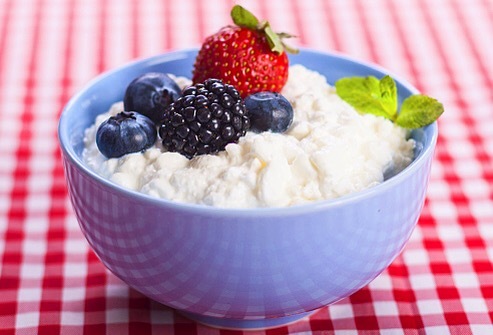 Pair a cup of low-fat cottage cheese with half a cup of fresh or frozen blueberries and a little of your favorite no-calorie sweetener. The result? A dessert-like snack with 18 grams of carbs. 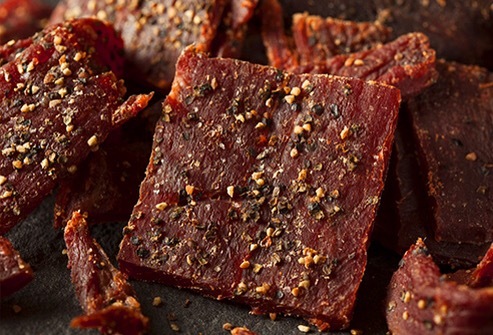 Jerky has been going upscale in recent years, and there are better options now than the over-processed mystery-meat versions you’ve had before. Look for jerkies made from grass-fed beef, which have big flavor and just 10 grams of carbs per serving (about 1.5 ounces). Remember eating this snack with your homework after school? It’s still a good idea! 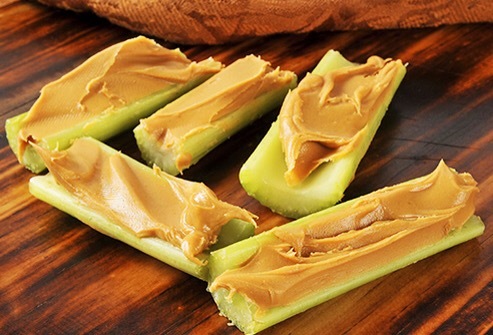 Fill two medium celery stalks with 2 tablespoons of natural-style peanut butter for a nibble that will take you back to your childhood, with only 9 grams of carbs. Mixed nuts are an all-time snack classic for good reason. They’re just as satisfying at your desk as they are at a party. 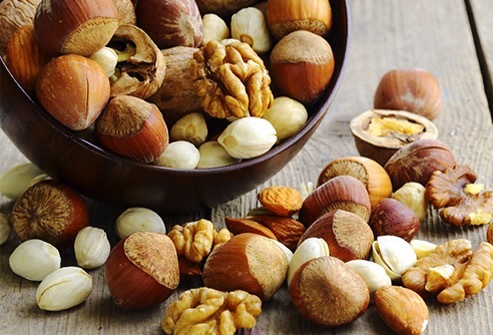 One ounce of crunchy, salty, mixed nuts will keep your energy up for hours for only 5 grams of carbs per ounce. 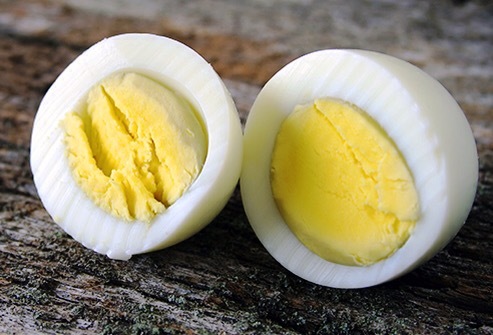 Hard-boiled eggs are the original grab-‘n’-go power snack. Cut one in half and spread on a little hot sauce (such as sriracha) to make it as full of flavor as it is of protein. That’s a zesty bite for less than 1 gram of carbs. 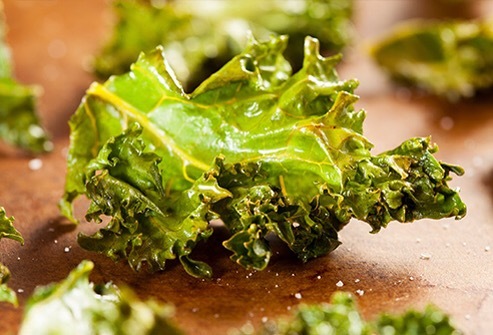 Even kale haters come around when they taste kale chips. Some store-bought varieties have less than 10 grams of carbs. You can cut that number even further by making them at home. Tear the leaves from a bunch of kale. Rinse and dry them. Toss with 1 tablespoon of oil and 1/4 teaspoon of salt. Roast them in your oven at 300 degrees for 20-25 minutes, until the kale is crispy. 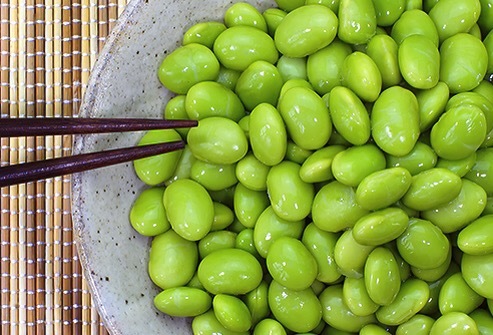 Also called steamed soybeans, edamame taste great, are full of fiber and protein, and have just 8 grams of carbs in a half cup of shelled edamame. They’re easy to make in your microwave, so keep a bag in your freezer. Though they’re often spotted together, hummus isn’t married to high-carb pita bread. 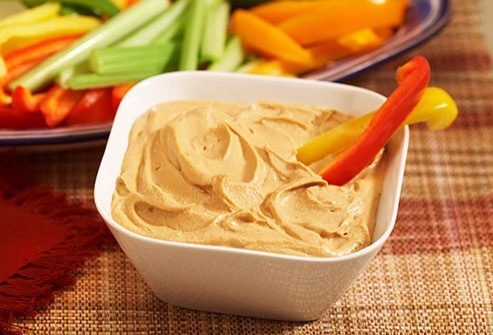 Spread 1/4 cup of hummus onto wedges cut from one red bell pepper for a filling, tasty snack that has 16 grams of carbs. Get the health benefits from tuna without all the carbs that come with your typical tuna sandwich. 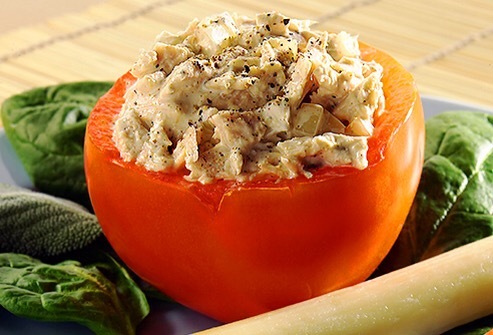 Pack 3 ounces of canned tuna into a ripe tomato half for a hearty snack with only 3.5 grams of carbs. I met Ellie when she joined my Pilates sessions as a guest. A busy mother of a grown up family, walking her dogs twice daily, a keen dancer and working full time she needed a no nonsense solution to her needs. This is Ellie’s transformation story. In May I went to the Doctor because I felt rubbish, I was tired, grumpy, sleeping poorly, my skin was dry and flaky, my hair was coarse and thinning and my nails were peeling and breaking. I was overweight and nothing I tried could shift the excess. The doctor suggested a Well Person MOT and blood tests. I also decided that I would also take matters in my own hands and start following more closely the nutritional and exercise advice offered by Jackie. I started slowly, making little changes, then attended Jackie’s irks hop in June and it was a revelation. I learnt so much!! I feel better than I have for a long time, many, many friends and family have noticed too! Everyone wanting to know what I had been doing to make such a transformation, including my GP when I went back for 2nd blood tests in July. Hair, skin, nails, posture, sleep, energy and flexibility ( which has been noted at by dancing class) all improved. The classes are great fun too! As you can see Ellie was very pleased with her results. She’s a great example of a client that gradually made nutritional changes, committed to regular exercise sessions and worked hard to stick to her simple plan. She followed this blog, my twitter feed and joined my support group too. If you read this and want the same results – get in touch for FREE trial. I have a few trials of 7, 14 and 21days to show just how simple it is to get REAL results without starvation, fad diets, crazy exercise, hours on the treadmill or running through mud! I offer science based Nutritional Coaching, Intelligent group exercise, Support and guide acne based on over 30years experience working as fitness instructor and teacher trainer. My sessions are based in my private wellness studio in Cheltenham – arrange your trial today – don’t put it off any longer. Within a few weeks, just like Ellie, you could feel like a New woman! Your Results – What Do They Mean? 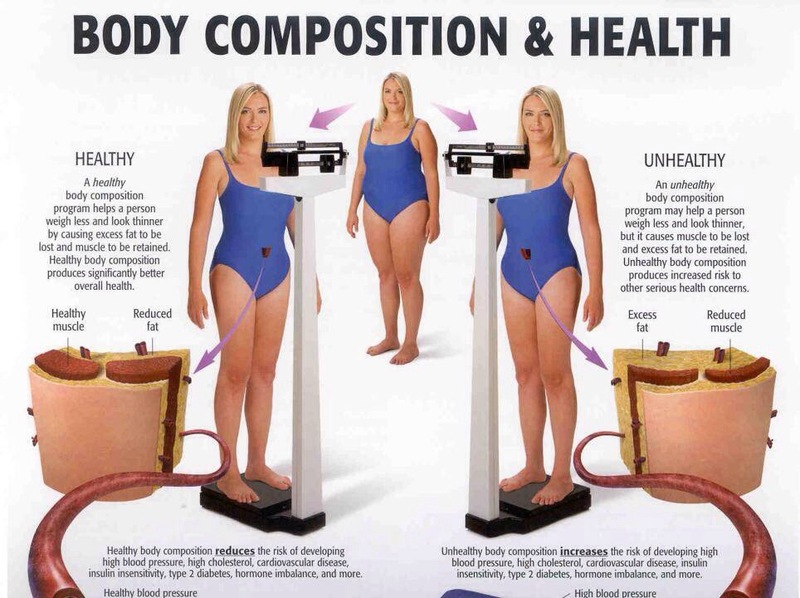 You’re losing scale weight but also losing muscle mass…. 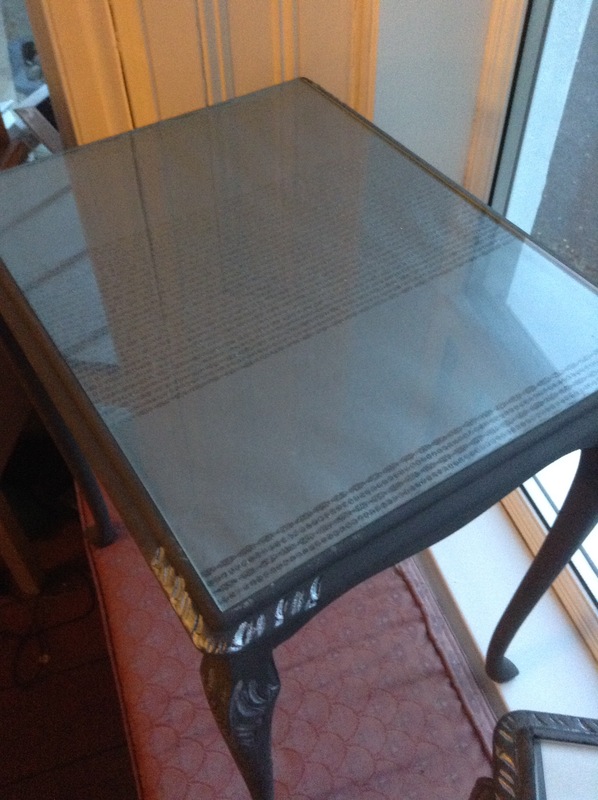 This suggests a couple of solutions……. A. You need to exercise much harder to maintain your lean muscle. You see, your body will drop muscle when you reduce calories, because muscle demands more energy to maintain than fat stores. The only way to avoid this happening to you is to exercise very hard – to the point of failure and exhaustion – so your brain believes there is a threat that you may need your muscles in order to escape! Try interval training – but it must be High Intensity Training. B. 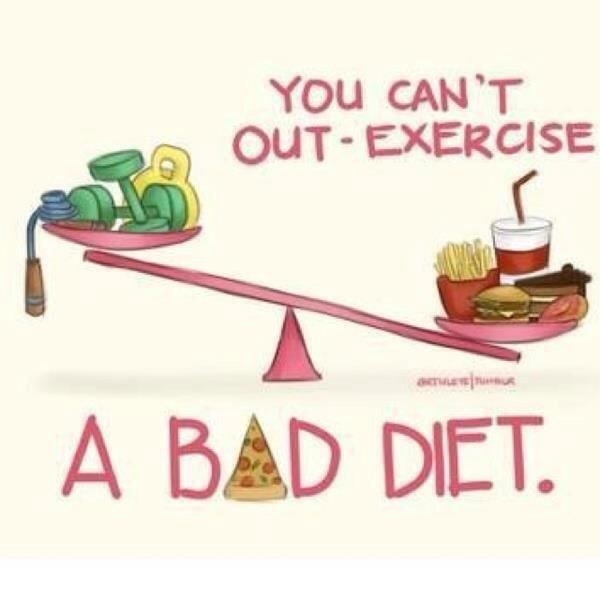 You have reduced your total calories by too many, forcing your body into starvation mode. 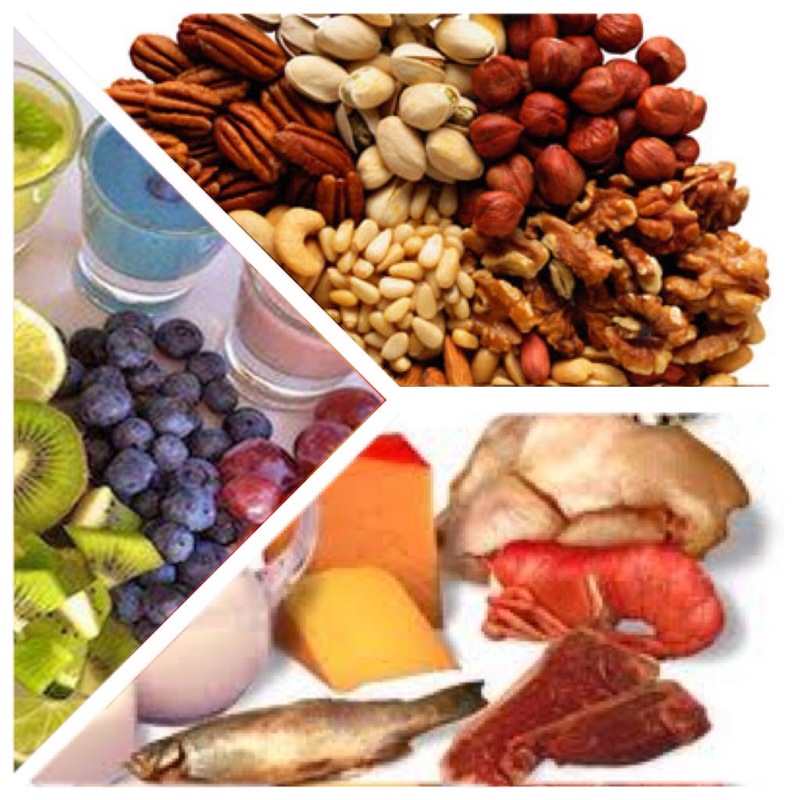 Take a good look at what you are really eating – you can eat MORE and drop fat! C. You need to increase your lean protein so that you can build, repair and maintain your hard earned muscles. If protein is low, you will train hard and not see any body shape changes! D. You’ve gradually reduced calories, meals and snacks over a long period of time and think that exercising harder or more often you’ll see results once more. What you don’t realise is that you have trained your body to exist on less and less food. You may have to gradually increase total food and more importantly nutrition quality to boost your Fatloss hormones before you see any results. All these situations will be much easier to manage if you keep a detailed food journal, plan shopping lists and menus each week. This may sound like a bit of a drag, but you will see results and learn what works for you much faster. Most importantly measure and weigh every month. If you train with me I can do this any Saturday, before or after class or before or after any workshop.